When a construction company owner's son (Rafi Gavron) gets set up and is facing jail-time for narcotics. The father goes undercover to reduce his son's time. That means going behind enemy lines, and working his way up the latter of the drug trade. From the small scale dealers on the street to the kingpins in Mexico, he meets them all. Based on true events, this is the story of a father who stopped at nothing to get his son out of prison. 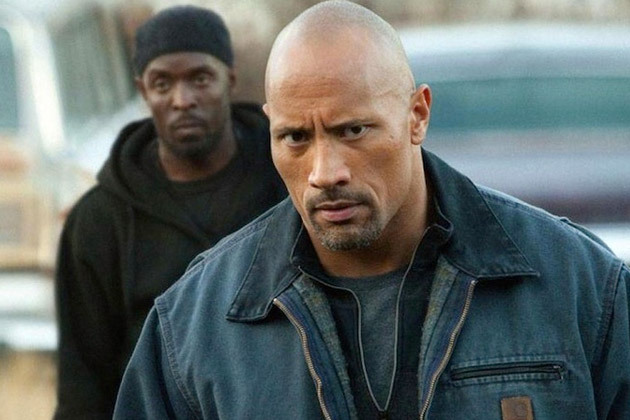 Dwayne "The Rock" Johnson plays John Matthews the construction company owner, and Gavron plays his son Jason. The two actors have very good chemistry in their few scenes. I think The Rock is an actor that has incredibly underrated range. He's one of the very few action stars that can actually flesh out the human side of his characters. He's a guy that make the every-man look absolutely natural, something I don't think Schwarzenegger, Stallone or Van Damme can pull off. The rest of the cast is solid, which includes Susan Surandon, Barry Pepper, Michael K. Williams, Benjamin Bratt (never knew this guy had such an evil side!) and Jon Bernthal. Its a solid ensemble and they each do great work. I have to warn you though, despite what the trailers, posters and The Rock starring have to say, this is NO action movie. I repeat, this is not an action movie. I know full well that the marketing is pushing the public to think it is an action movie, but it is not. There is one big action beat that lasts about 15 minutes at the end of the film. But it isn't exciting, thrilling action. It is all very grounded and realistic. It is also over before it really begins. Not saying that the movie relies on being an action movie, "Snitch" is an effective little film. But its a little disappointing that this isn't the action movie the advertising promised. It also doesn't help that the movie is kind of pedestrian and predictable. Despite being fairly effective, everything adds up just as you would imagine. For a movie that is trying to make a comment on the injustices of the justice system, the film kind of comes off as a Hallmark movie. Not exactly what you would expect from a movie headlined by Dwayne Johnson. I think it is blasphemy that a first-time, non-violent drug offender gets a longer prison sentence on average compared to rapists and those convicted of manslaughter. I think its an idea that deserves debate, but the movie has to flesh out its side of the argument better for me to care. Overall, I am definitely thinking about the idea, but the movie didn't win me over with its political stance. Despite a non-existent action movie stuffed into a political drama, nothing could stop all the great actors from making this all matter. The one action scene is kind of neat, I just wished there was more. I have nothing against a good drama, and the actors certainly do their job. As the credits began to role, I just wanted more from the experience. I am sad I didn't get it. My Reaction to "Agents of S.H.I.E.L.D." The Essentials- "The Big Lebowski"
Classic Wolverine Costume Almost used? The Cast of Fast & Furious 7 gets bigger! J.J. Abrams' mystery project reveals itself! First Look at Tom Hardy as Mad Max! Overlooked Film of the Week- "Four Lions"
Transformers 4 title and teaser poster revealed!